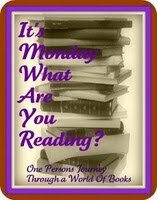 The Norwegian Book Girl: It's Monday! What are you reading? This is a weekly meme hosted by Sheila on Bookjourney. In this meme bookbloggers get together to share what they read last week, what they are are currently reading and planning to read this week. One can also post a list over last weeks reviews. I had a very busy week, so I didn't get to read as much as I wanted. But I started some books. Hopefully I will get more reading time this week. I am currently posting a lot of reviews I have posted earlier on my Norwegian blog. I am reading so many books right now - so cool to see all of your titles coming up. Enjoy them - I am excited to see some of these reviews! Thank you for the link, Elida :) I wish I had the time to read so many books in one week. Sheila: Thank you for hosting this meme :) It is so interesting to read what other bloggers are going to read and review soon. These all look very tempting...hope you're enjoying them. You have a lovely blog, Norwegian Girl. Ava: Thank you :) I am also following you , now. Laurel: Thank you so much :) Hush sounds like a great read.